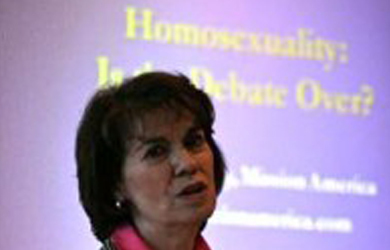 Mission America’s Linda Harvey has finally exposed the secret that all gay people have long sought to conceal: that they are secretly straight and are just pretending to be gay! In a WorldNetDaily column today, Harvey argues that “no one is a homosexual and everyone is a heterosexual.” “‘Gays’ are all closet heterosexuals, terrified someone will find out and blow the lid off [the gay rights] movement,” she adds. While she never explains why anyone then would “choose” to be gay, Harvey does compare gay people to damaged cars in need of an auto repairman to fix them. They wonder if they might actually be heterosexuals after all. With the upcoming Winter Olympics, not only do the Russians have to figure out if/when radical Chechens may incite violence, they have to keep an eye on the “LGBT” folks, too, not necessarily for terrorist acts, but just for generally annoying disruptions. The international outrage of homosexualists is being unleashed on Russia because of a new law. Russia actually allows open homosexuality among adults, but passed a law recently prohibiting the promotion of homosexuality to minors. So what’s the concern? Don’t we all want the best for children? Apparently not. The fear of the pink mafia is that the soft underbelly of their movement will be exposed, showing they badly want to influence children and also that there’s no inborn homosexuality. This reality is the backbone of the new Russian law, because children can be influenced toward harmful behaviors that are unnecessary, unnatural and harmful. Horrors, comrade! “We can’t let anyone figure this out, not while all this television coverage is going on!” HRC must be thinking. So the perpetually ticked homosexual movement will screech, prance and whine, accusing everyone in Russia of mob attacks, or human rights violations, or whatever. This is how bullies behave. They push others around as a cover for their own weakness. America is just now beginning to see this movement for what it is. When Vladimir Putin said that “gay” Olympic athletes and visitors have nothing to worry about in Russia as long as they “leave children alone,” he has framed the situation with a vital truth missing for years in the West. Children suffer for being exposed to and sold this deviance, because none of them have the “born-that-way” destinies Western and EU activists wish existed. 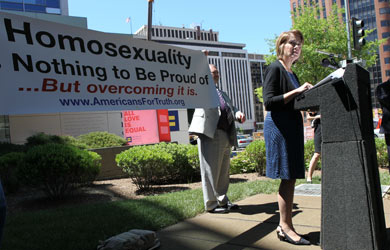 The infuriated “gays” are all closet heterosexuals, terrified someone will find out and blow the lid off this movement. Remember that decades-old standby claim of the “gay lobby,” that those who concentrate on exposing and fighting the homosexual agenda must harbor repressed “gay” desires? Well, no more so than plumbers and auto repairmen might be called “obsessed” with pipes and transmissions. It’s because something is broken and needs to be fixed. And the brokenness is getting in the way of a functioning pipe, car – or culture. The reality is, no one is a homosexual and everyone is a heterosexual. And those who have developed, fantasized and nurtured those “gay” feelings really don’t like reality. It makes them want to attack. Or it makes them start vicious organizations like GLAAD, to make the lies seem real and respectable. It makes them stupid enough to try to take on the Russians. All I can say is, good luck with that.